Here are some facts about the Giant’s Causeway. The Giant’s Causeway is a natural rock formation. It is located on the northeast coast of Northern Ireland, in the county of Antrim, a few miles from the town of Bushmills. It is the most popular tourist attraction in Northern Ireland and was voted as the 4th best natural wonder in the UK. In 1986, UNESCO declared the rock formation a World Heritage Site, the only one in Northern Ireland. 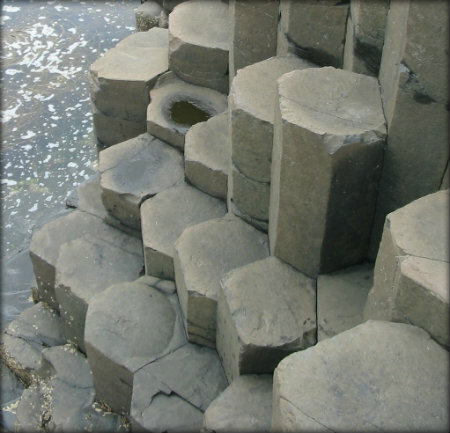 The formation consists of about 40,000 interlocking basalt columns, most of which are hexagonal. The columns form huge stepping stones, some as high as 39 feet, which slope down to the sea. Some of the columns have four, seven or eight sides. Weathering of the rock formation has also created circular structures, which the locals call ‘giant’s eyes’. Many of the columns fit together so closely that it is impossible to insert a knife blade between them. When viewed from above, the causeway looks like a man made street. A local legend says that the Giant’s Causeway was built by Finn McCool, a magical giant. One of the rock formations resembles a giant boot. Finn supposedly built the causeway so that he could reach Scotland without getting his feet wet. There is a similar rock formation 75 miles away across the sea, at Fingal’s Cave, in Scotland. The Giant’s Causeway was actually formed by intense volcanic activity about 50 million years ago. As the lava rapidly cooled , it contracted into the distinctive shapes. The rocky coastline around the Giant’s Causeway has caused many shipwrecks. In 1588, over 1,000 men were killed when a Spanish ship sank and today, the rocks are known as Spaniard Rock. The Causeway is an excellent place to spot sea birds, including razorbills, cormorants and petrels. Some rare plants also thrive in the rock formation, including sea spleenwort. thanks a lot 🙂 . thanks this information helped me a lot in class, once again thank you.